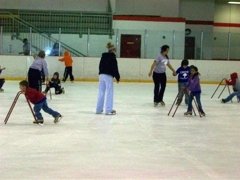 Raise money for your club or organization by hosting a group skate at Addison Ice. Call (630) 543-9200 for more details and to book your fundraiser today! Add ice skating to your school's physical education department! Ice skating not only improves motor skills, agility, balance and speed, but also increases self-confidence while teaching dedication, patience and self-motivation. Through Schools on Ice, we will work closely with your physical education teachers to design an Ice Skating Unit suited perfectly to your curriculum and time allotment. This unit can be as simple or as advanced as you wish. From the basics of skating to the rules of hockey, this program is built to fit your needs. It's ideal for home school students too! Call us today at (630) 543-9200 for more details and to schedule your Physical Education Program! Looking for a new way to increase school spirit? We've got your answer! Rent the ice for your school for a night and you are guaranteed a memorable experience. Make the event special by having your students and their families wear the school colors and asking your Booster Club and/or Student Council to sell school merchandise! Call us today at (630) 543-9200 for more details and to schedule your School Group Night! For groups of 20 or more, please call (630) 543-9200 x102 to learn about rates and book your event.